To hear Chinese state media tell it, the soldiers of the People’s Liberation Army will go into battle in the future wearing an array of high-tech gizmos. In their hands will be enormous weapons combining a rifle with a 20-millimeter grenade launcher akin to the old — and cancelled — American OICW. On top of that, they will have heads-up displays and networked positioning systems so Chinese troops can monitor each other digitally, almost like a video game. It looks impressive, and Chinese announcements of the system have circulated in the press with varying degrees of skepticism and hyperbole. 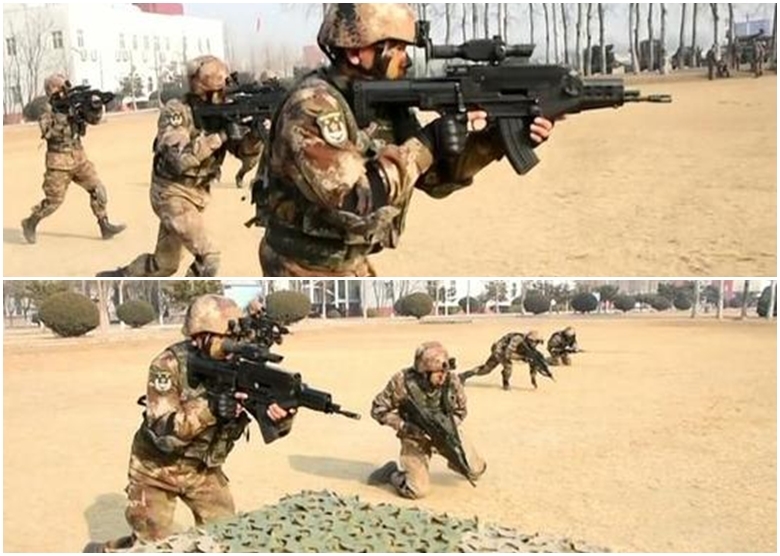 A more skeptical take recently came from the military news wire Shephard Media, which pointed out that China is claiming the 20-millimeter hybrid weapon, dubbed QTS-11, can fire airbursting grenades lethal within a radius of 7.7 meters. Be wary of such claims. The U.S. version of this weapon from years ago, the OICW, also included a 20-millimeter grenade launcher but the U.S. military found it to be ineffective. A grenade’s lethality primarily comes from shrapnel, but the pieces of flying metal were often too light and often dispersed upwards and away from the target. Ultimately, the U.S. military lost interest, though the OICW did inspire the M320 grenade launcher and the problematic — and now cancelled — XM25. South Korea developed its own tricked-out future rifle called the K11 and adopted it into service. But the K11 was plagued with problems from the fire-control system to the optics and the barrel — it wobbled. Another issue is that the K11 is huge and heavy at 13 pounds unloaded. So like the OICW, the result is a big, bulky rifle with an underpowered grenade launcher. And like the American version, it’s expensive. Armies tend to like reliable, effective and affordable rifles — all factors where these hybrid weapons have been found lacking. This was in reference to the electronic gadgets that come with the system — a “full digitalized integrated soldier combat system, including detection and communications,” Chinese state media added. Years ago the U.S. Army worked on its Land Warrior program which attempted to equip networked soldiers with battery-powered devices such as smartphones and integrated helmets as if troops were operating in a science-fiction movie. The larger goal was to peer through the “fog of war” with soldiers digitally marking enemies on digital maps, while also being able to track the location of fellow soldiers to reduce friendly fire incidents. It hasn’t been easy. The need to lug heavy batteries with a finite amount of energy, and unreliable connectivity, has bedeviled developers. But the Army kept working on it. The program turned into Nett Warrior and then Precision Fires-Dismounted — or PF-D — for artillery gunners. The U.S. Army believes smartphones are a cheap and practical tool to help forward observers pick targets, send the information back to the guns stationed miles away, which then rain down shells. That may be where China’s own experiments in this technology end up. The U.S. Army’s Foreign Military Studies Office, meanwhile, has speculated the Chinese announcements may serve as a form of propaganda, noting that the Sky Wolf Commandos are stationed near the Indian border, where China routinely times military declarations for geopolitical purposes. We’ll see. Exoskeletons are extremely difficult engineering challenges that try to augment something humans are already evolved to do — resulting in tiring out the human operator instead of strengthening them. Still, perhaps the Chinese military will develop a machine or weapon that has more success. Or maybe it’s just a psychological mind-game.